At races we hear the chatter, "He's way too young for that." "Why would they push her like that?" "That can't be healthy." We see people whispering to each other, pointing and even staring. Some try to use the concerned angle, "Is that good for them?" or "What if they get hurt?" Our children are typically the youngest participants at any given 5k by five or more years yet still frequently place in their age group. It's obvious that we are forcing our children to do what we love! Or are we? Several years ago when Chanda started running I would take the kids to the trail, load them up in a wagon & a stroller, hand them snacks & drinks and follow down the trail after her. Obviously we couldn't keep up but I thought it was important that we show our support. (Plus it was nice to be out in the woods most evenings). It wasn't long before the kids wanted to run with mommy. Chanda was very accommodating and would occasionally let them tag along for the first mile or so, slowing her pace to about a twelve minute mile and then waiting with the kids until I caught up with the babies, the wagon and the stroller. The first time they ran with her we were amazed. They didn't want to stop at the mile marker. After a few times of one mile runs we decided to let them add a second, and then a third mile. Soon they were asking when they could run a 5k. At first we were a little hesitant. We had always allowed the kids to participate in the "kids fun runs" but running in an actual race...with adults? Don't races have age requirements? We did a little research and it turns out that most 5k's do not have a minimum age. Lilli ran her first 5k labor day of 2010 and took second in the 14 and under age group. At five years old she was less than half the age of the kid that beat her. Since then our two oldest children have run a combined total of nearly a dozen races, we've completed a race together as a family (babies in strollers) and Faith, our two year old has completed several one mile runs. Along the way we have been approached by both concerned people and intrigued parents. Below are some of the most common questions we field and our answers to them. Is that good for them? To our knowledge there is no evidence to say that running is bad for children. It comes naturally to them. Don't believe me? Try this experiment: take a five year old to the playground and tell them not to run, then release them to play. Time how long it takes until they break down and disobey you. I guarantee they won't last ten minutes. Kids run...and they love it! It's not until we get older and lazier we they learn to love being sedentary. A recent study followed several children's hospitals keeping an eye out for running related injuries in children. To their astonishment all of the running related injuries they saw were actually connected to the act of falling rather than running. Scrapes, cuts and the occasional broken bone were the primary injuries. Pulled muscles and over-use injuries were practically non existent. It seems that children really were born to run! My kids do very little training. It is my belief that any moderately fit five year old can complete a 5k so there is no need to push them. Occasionally one of my older children might say, "Dad, I need to get a couple miles in today" or "I need to get in some hill training before this next race." When they say that I do everything possible to make sure that we fit their workout into our schedule either the same or the following day because I want them to know that I support them. While we are on our run I try to encourage them to push through discomfort and guide them to maintain their naturally good form but more importantly I keep it light and fun. Nothing is a bigger turnoff to a child then being pushed too hard. 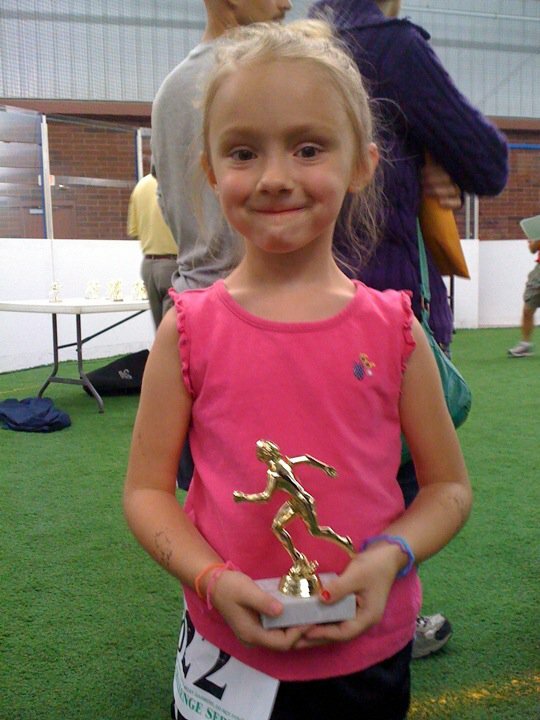 What is the best way to get my child into running? I suggest signing up for races that also have kids fun runs. They are usually only a mile, most kids can complete them with relative ease and in many cases, every participant gets an award. Then ask another adult to wait with them at the finish line of your race so they can cheer for people (and you!) as they come into the finish. This is a great way to get your child pumped up about races and introduce them to running as a sport. I think you guys are doing an awesome job setting good examples for your kids!!! Let them run as long as they think its fun! And then some!! I think this is awesome! You are paving the road to a healthy adulthood! Quit making these children run 20 miles, and start carrying their water!! Ha!